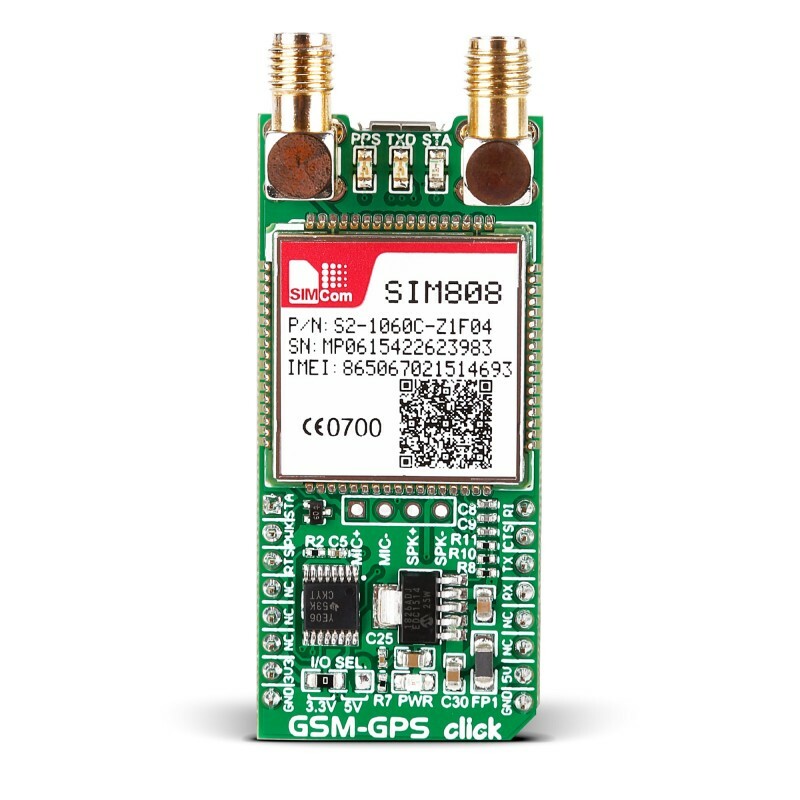 GSM-GPS click is a mikroBUS add-on board with a SIM808 module that combines GSM/GPRS and GPS into a single device. Ideal for remote tracking devices in any shape or form. The high-performance GSM/GPRS engine works on GSM, EGSM, DSC and PCS frequencies. The GPS has a 1 second TTF (Time To First Fix) from a hot start and 30 seconds from a cold start. Tracking sensitivity is -165 dBm. The board has two antenna connectors, one for GSM the other for GPS. The bottom side has a SIM card slot and a Micro USB connector for interfacing with a PC. 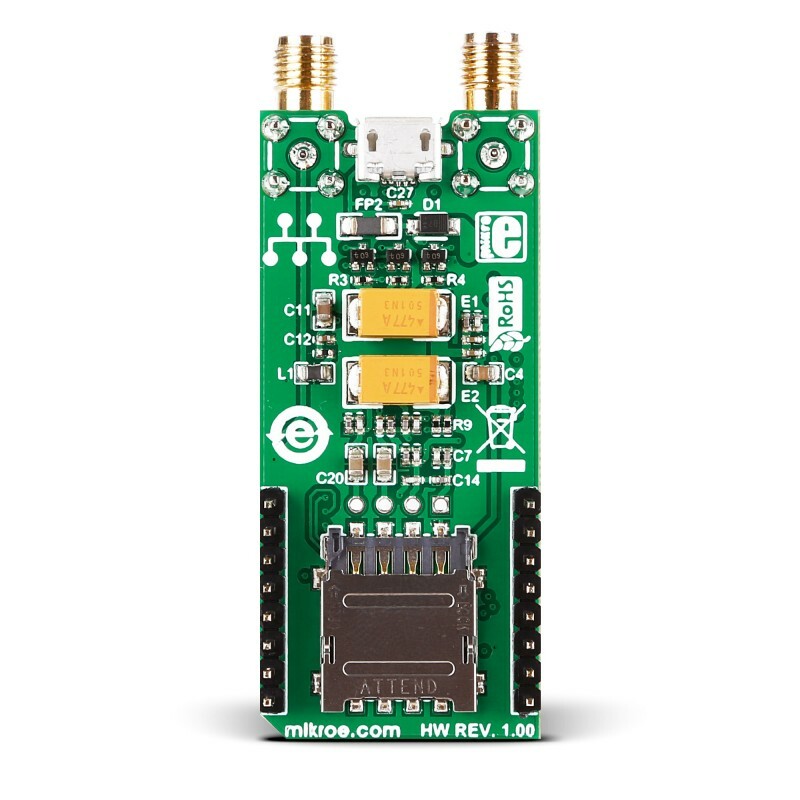 GSM-GPS click communicates with the target board MCU through mikroBUS UART interface, with additional functionality provided by STAT, PWRKEY, RTS, RS, and CTS. Beside the mikroBUS, the board has additional pins for connecting speakers and a microphone to the GSM engine. 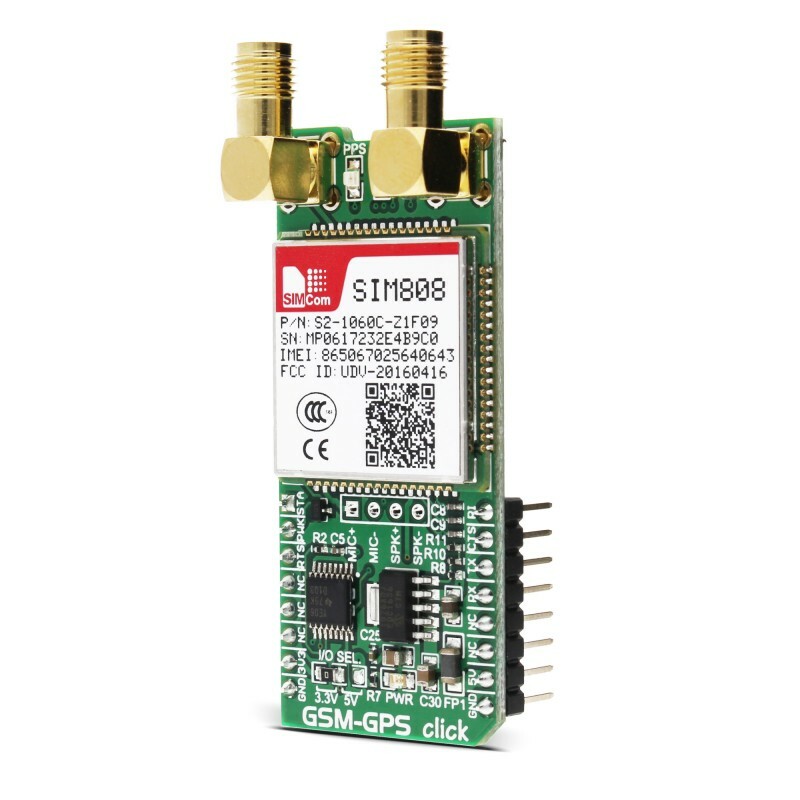 GSM-GPS click uses the 3.3V and 5V power supply. 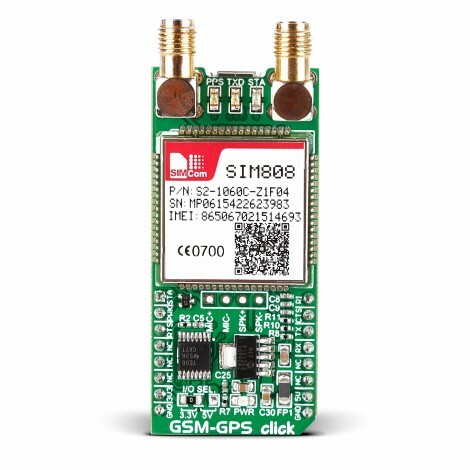 Applications GSM and GPS, remote functionality. This code snippet sends an SMS message with current GPS position coordinates. 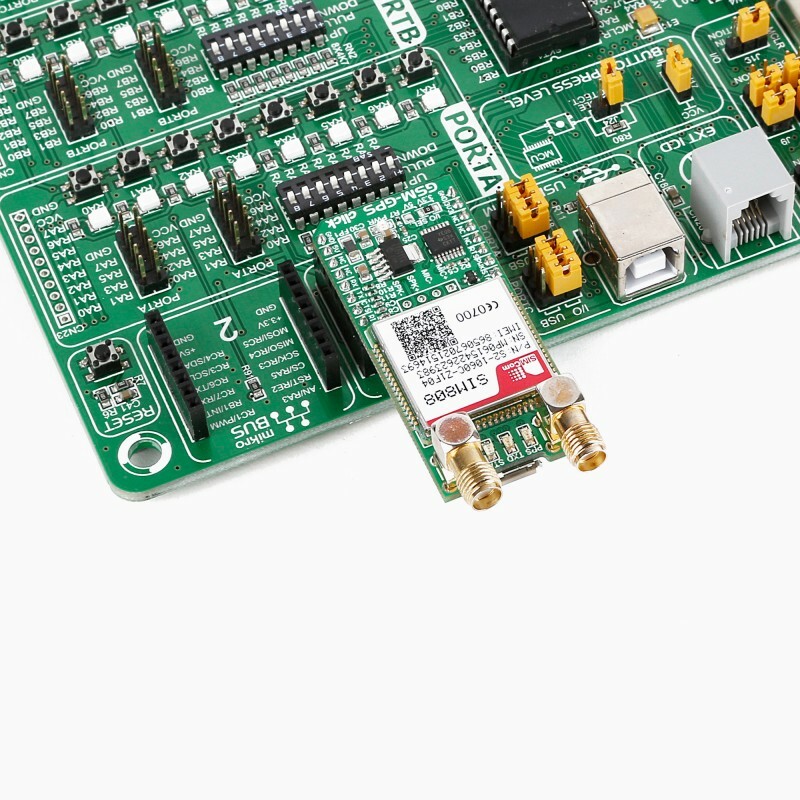 Code examples that demonstrate the usage of GSM-GPS click with MikroElektronika hardware, written for mikroC for ARM, AVR, FT90x, PIC and PIC32 are available on Libstock.